What Counts as AD/ADRD Research? 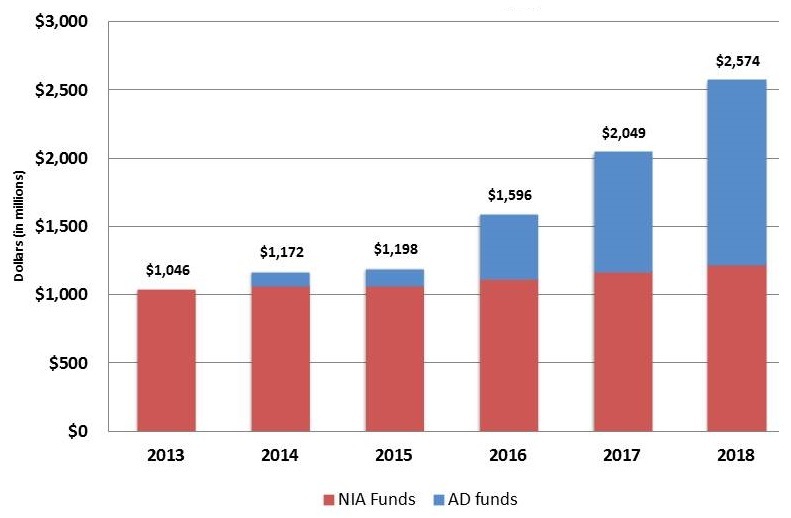 Past/current appropriations, including funds that have allowed us to address milestones "in advance"
Progress on milestones -- what have we accomplished? what new milestones are emerging? Incorporating new care/services research milestones along with other milestones that are focused on drug development, etc. Large project needs -- emerging clinical trials, etc. Emerging investments by other groups -- what gaps are best filled by the NIA/NIH? Adapted from Jack et al., Alzheimer's & Dementia (2018) 14(4): 535-562. Silverberg et al., Alzheimer's & Dementia (2018) 14(4):576-578. Hundreds of studies have looked at the efficacy and effectiveness of care/caregiving interventions, but what is the quality of evidence supporting readiness for dissemination of any of these? Goal: The 2018 Summit was built on the foundation laid by the NIH AD Research Summits held in 2012 and 2015. It featured progress towards achieving the AD research implementation milestones and continue development of an integrated multidisciplinary research agenda necessary to enable precision medicine for AD. Enabling rapid translational learning through open science systems and incentives. The Day 2 Program was cancelled due to inclement weather. Day 2 Program rescheduled for May 24 as a live video-cast event.